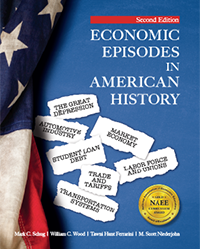 Educators using Economic Episodes in American History, Second Edition may be interested in printing and posting in their classroom a copy of an Economic Thinking Poster. Click below to download the Economic Thinking Poster that accompanies our textbook. To share this PDF with a colleague, just type their email address in the box below.